Maternal aggression occurs when a queen (female cat) becomes especially aggressive. Her aggression is meant to protect her kittens and can be directed at humans, other animals, or other cats that come between a queen and her new litter of kittens. Male cats have been known to cannibalize kittens, so there is justification in the queen's protective nature. Since it's in her natural instinct to keep her kittens safe, her actions make sense. As the kittens grow and get older, the aggression will often wane. After the queen cat has delivered her kittens, maternal hormones are present in her body. These can certainly impact how the cat is acting and reacting. The mother cat feels extremely protective and may develop hair-trigger tempers. Cats instinctively react with what some call a "stranger danger" alert whenever they come in contact with something or someone unfamiliar. 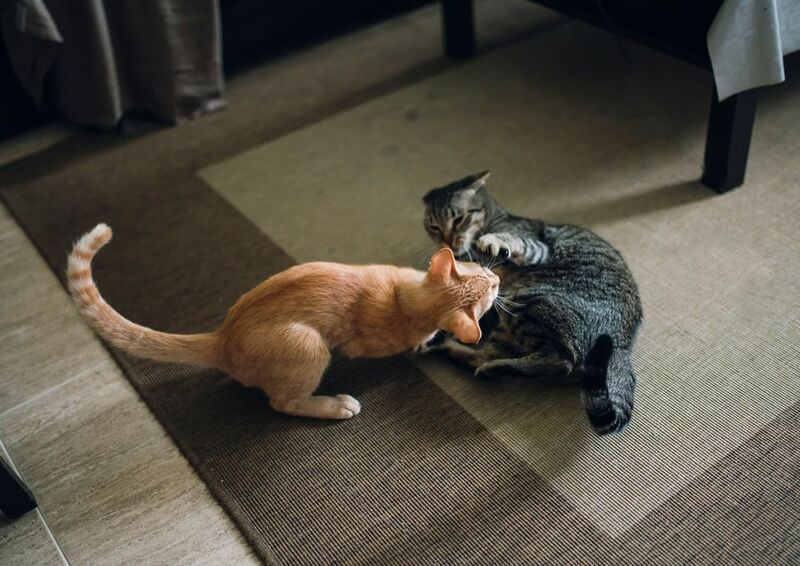 Any new cat coming into a resident cat's territory will feel defensive and introductions can help smooth the transition. But mother cats also feel protective of their litter, as well as of the surrounding area/territory. The mother needs to provide a safe zone for the kittens and any interlopers are seen as threats to her offspring. Feline protective aggression rules queens in the first three to four weeks following the birth of the kittens. This is when the new kittens are most vulnerable (and her hormones are the strongest). Anything unfamiliar is identified by the cat as potentially dangerous and therefore a threat to the babies. Even if the cats had been friends previously, it's likely that the queen cat would act protective and strive to keep the other cats at a distance from her offspring. While most aggression is directed at other cats, it can be directed at humans too. Avoid handling the new litter for the first few days of their life. Some of this aggression will fade once the kittens mature and become more independent, but you can help in the interim by reducing the stress for all of the cats. If you have other cats living in your house, the queen cat should have separate food, water, and her own litterbox. This allows her to stay close to her babies and avoid contact with any other cats that cause stress. Reducing any anxiety over sharing will cut down on chances for aggression. Help the queen cat by setting up your household in a way that protects the kittens. A baby gate can be useful in establishing an area that is safe and confined for the mother cat and her babies. The mother cat will likely still be able to hop over a low gate, but it will relieve her concern if she knows the babies can't wander. If there are other cats in the house, they should not be allowed in the area for the kittens. As the kittens begin to mature, lead the mom cat out of her confined area for some playtime and have someone else have some playtime with the kittens. As the kittens begin to mature, the mother will engage in some natural behavior that helps the kittens grow. Some mother cats will move their kittens every day and others will move them only if they get frightened. This natural response is the mother's way of hiding her kittens from predators. The mother cat will also begin mewing to her kittens so they learn the sound of her voice and to come back to her. All of these actions are quite natural and you should let the mother cat engage in them. She may get aggressive if she is interrupted (again, because she will see it as a threat to her kittens). If the mother cat is mewing especially loud or seems particularly stressed, make sure a kitten isn't stuck in a new location and can't make it back to its mother. Don't fret too much if the queen cat aggression seems quite strong when the kittens are born. Give the mother cat a few weeks to adjust to her new role and see how her aggression levels are once the kittens are about a month old. Once the kittens are weaned, you can spay your female cat to prevent additional litters (and the maternal aggression that comes with new kittens).